Ocean Galleries is a distinguished and established fine art gallery with locations in Avalon and Stone Harbor, New Jersey. We represent national and local artists; originals and fine art reproductions. All custom framing is done in our facility and we are regarded as an industry leader for quality and design. Ocean Galleries also offers a wide variety of hand-crafted items such as glass, jewelry and furniture. In 1986, the Millers opened the doors of “Kim Originals,” a custom frame shop and contemporary art gallery located in Avalon, NJ. 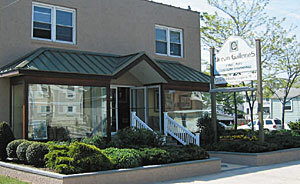 In 1990, a second location was established in Stone Harbor. Since that time, the gallery has broadened its vision and has become nationally known, hosting shows with such artists as Peter Max, Josef Kote, Autumn de Forest, Romero Britto, Charles Fazzino, Graham Nash, Ringo Starr, Hessam, Aldo Luongo, Jane Seymour, Don Hatfield, Howard Behrens, Jiang, Wyland, Viktor Shvaiko, Sam Park, and many others. Throughout the years, the gallery has experienced a substantial growth of excellence and continues to represent important national and local artists. As a dealer to individuals and corporate collectors, Ocean Galleries promotes artists with extraordinary abilities and established value. The mission of Ocean Galleries is to personally introduce our clientele to the fine artists we represent and to share their most recent artwork. We practice the highest standards of credibility and integrity in a comfortable and unpretentious atmosphere.